We planted a smaller garlic crop for 2012, but what a beauty it is. All the rain this spring and early summer, and good sunshine in the latter part of the summer has meant big healthy bulbs. Other factors might include that we used a no-till method on our garlic beds this year, covering the soil immediately with mulch after last year’s harvest. We also used Gaia Green 4-4-4 organic fertiliser for the first time courtesy of our friends at Garden Hoe Farms. We trialed three new softneck garilc varieties this year, and found some interesting outcrops of miniature bulbs up the stems of many of the Mount St Helens variety. We thought they look a bit like garlic fibroids. Enjoy the pic. 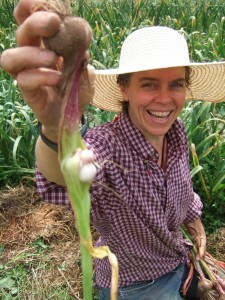 We’d also like to ask that people place their garlic orders for 2013 now, so that we can plant accordingly this fall.